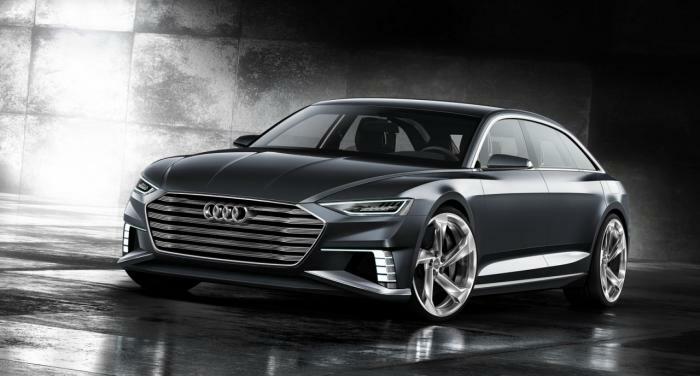 Audi has officially unveiled the Prologue Avant concept, ahead of its debut at the Geneva Motor Show. Described as a "new interpretation of the Avant philosophy," the concept is a stylish wagon that has a wide single frame grille that is flanked by Matrix Laser headlights and sporty air intakes. Moving further back, we can see muscular fenders, chiseled bodywork and handle-less doors which are operated by a discreet sensor that is integrated into the aluminum window surrounds. The concept also has a tailgate-mounted spoiler, three dimensional taillights and 22-inch alloy wheels. The interior is tastefully restrained and features an elegant mix of materials including aluminum, dark ash wood trim and Unikat leather. Despite the relatively clean design, the car is loaded with technology as it has three touchscreen displays and two detachable OLED displays that act as a rear seat entertainment system. The concept also has four individual seats and a long center console with a pass-through that "appears to hover." Power is provided by a plug-in hybrid system that consists of a 3.0-liter TDI engine, an electric motor and a 14.1 kWh lithium-ion battery. This setup enables the car to produce a combined maximum output of 455 PS (335 kW) and 750 Nm (553 lb-ft) of torque. In terms of performance, the concept can accelerate 0-100 km/h in 5.1 seconds before hitting an electronically limited top speed of 250 km/h (155 mph). More impressively, the car averages 1.6L/100km (147 mpg US / 176.5 mpg UK) and can travel up to 54 km (33.6 mi) on electricity alone. Speaking of performance, the concept has carbon ceramic brakes, an adaptive air suspension and a dynamic all-wheel-drive steering system. The latter enables the rear wheels to turn up to five degrees for "good handling and high drive stability."